When you're in need of funding, receiving a term sheet -- a legal document that, despite its name, is usually several pages long -- is a reason to celebrate. You have probably spent hours working hard to land an offer from investors, delivering countless pitches and presentations along the way. But don't be so quick to sign on the dotted line. Term sheets also represent a means for investors and venture capitalists to dilute your shares and gain control of your board. There are several areas that frequently become points of negotiation between entrepreneurs and investors. Here are a few of the terms you should look over especially carefully. A securities lawyer can help you detect other possible snares. And don't forget -- most term sheets are nonbinding. Until you sign a formal contract, the investors can change the terms at any time. The valuation is what most entrepreneurs focus on first. It's basically an agreement with the investors about how much the company is worth. It is crucial to understand the difference between "premoney" and "postmoney" valuation -- the value of the company before and after the investment. For example, according to this term sheet, the company will have a postmoney valuation of $8 million. That includes $3 million from the investors. So the company's premoney valuation is $5 million. Do the math: The investors get a 37.5 percent ownership stake. The greater the premoney valuation in relation to the postmoney valuation, the more of the company the founders get to keep. 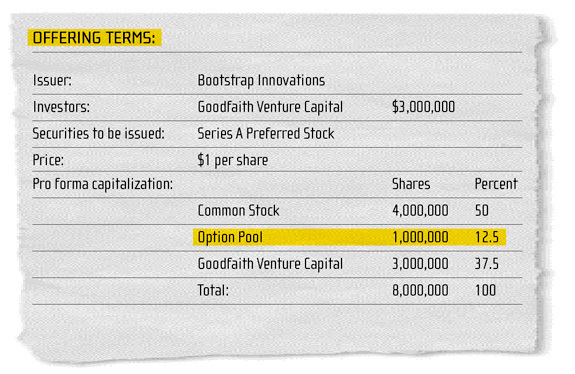 Most term sheets reserve some stock for an option pool, which will be used to compensate employees. A frequent area of contention is whether the size of that pool is determined using the premoney or postmoney valuation. "When it comes out of premoney, it dilutes the founders' shares," says Healy Jones, a former VC who pens the blog Startable.com. In this case, the option pool is 20 percent of the premoney valuation. Some term sheets include a vesting plan, which states that founders and other common stockholders are expected to earn their ownership stake over a certain time frame, typically two to three years. Because the founders own 100 percent of their shares before they bring on investors, agreeing to a vesting schedule "can be very confusing for them," says Salil Deshpande, a former entrepreneur and general partner at Bay Partners, an early-stage VC firm in Palo Alto, California. The reason for including this term is to ensure that the founders stick around, says David Freschman, managing principal of Innovation Capital Advisors, an early-stage VC firm in Wilmington, Delaware. Make sure you have adequate representation on the company's board. A typical term sheet might specify that the investors get two seats, the common shareholders get two, and a fifth goes to an agreed-upon outsider, such as an industry expert. But, when deciding who gets the seats for the common shareholders, be sure you leave room for both yourself and a CEO, advises Joshua Baer, founder of Austin-based OtherInbox, which recently raised $2.3 million in funding from angel investors. "Not all founders remain CEOs postmoney," he says. It's standard for investors to request an annual 8 percent dividend, but that money is rarely pulled out of an early-stage company, either because the company is not profitable or because it's wiser to reinvest the money in the business. If a term sheet states that dividends are cumulative, meaning that dividends compound year after year, watch out. That can end up being particularly expensive for a company that doesn't sell or go public for four or five years. If investors suspect one round of funding won't be enough, they might try to secure aggressive antidilution provisions, which prevent their equity from being diluted by later investments. These provisions, called a full ratchet, allow the investors to maintain the same ownership percentage in the company even if the company brings on additional investors. The difference, of course, is typically made up from the founders' shares. 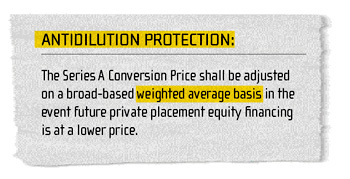 Fortunately, many investors will agree to a weighted average antidilution term -- like the one seen here -- which weights the value of the investors' money based on when it was invested. This tends to protect the founders' shares to a greater degree. Other than the valuation, how the founders and the investors will be paid after a sale or IPO can be the most contentious point of negotiation, says David Henkel-Wallace, a serial entrepreneur who has raised $60 million from VCs. Investors typically request preferred shares, rather than the common shares retained by the founders and employees. Preferred stockholders usually get paid first when everyone cashes out. "Participating preferred" stockholders also share in payouts that would otherwise go to common shareholders. This can get dicey when there is no cap on the payout the participating preferred stockholders receive. For example, according to this term sheet, the investors would receive uncapped participating preferred stock, which entitles them to two sources of cash if the company gets sold. First, the VC firm gets back three times its investment -- or $9 million -- plus any accumulated dividends. Then, because the investors own 37.5 percent of the company, they also receive 37.5 percent of whatever money is left over (if any) for common stockholders like the founders. Often tucked at the end of the term sheet is a standard "no-shop" provision that specifies that, upon signing, an entrepreneur will cease the process of courting other investors. Most investors ask for 60 days to 90 days, which is far too long, says Jones, who helped his new company, Pixily, raise $1 million. Jones suggests pushing for 30 days.